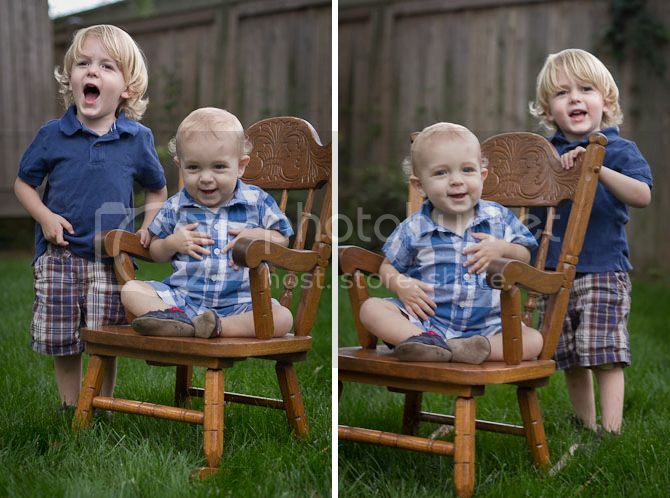 The biggest news from the past month--I sold the big rocking chair, so the next set of pictures will be in the boys' little rocking chair. Don't cry, really it's ok. We barely ever rocked the boys and it was taking up so much room. Goodbye pretty chair. Anyways, how fun is it to be 13 months old? 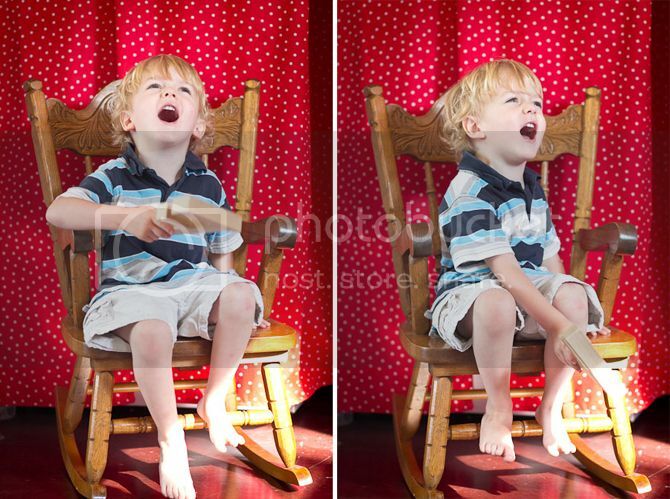 Boy is having the time of his life. He's a proficient hand-holding-walker and will stand alone for a few seconds at a time. I'm pretty sure Braden is waiting for Sol to be out of town to start walking so we can lay on the guilt when he gets home. He's finally a proficient crawler, even though he occasionally still flops on his belly to scoot around. I'm ready for those days to be over--he's ruined the front of quite a few shirts! 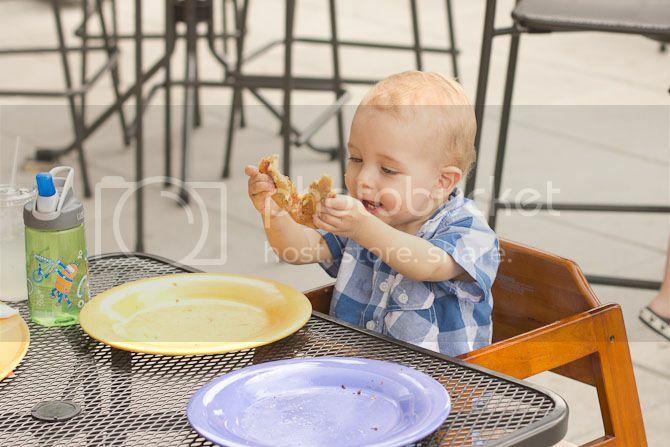 Braden is a garbage disposal--he'll eat and eat... I don't think I've ever really seen him get full. We spent the night in a hotel on our way to South Carolina and it was TERRIBLE--neighbors complaining about his crying, driving around town to knock him out, pacing in the hallway... then five hours of all three of us sleeping in a bed before he got up bright and early at 6. Sol and I realized how blessed we've been with his sleep--he's such a great sleeper that we really don't know how to handle it when he's having a hard time sleeping. He's getting better at expressing his preferences, he'll shake his head "NO" when he doesn't want something and can motion for what he wants. 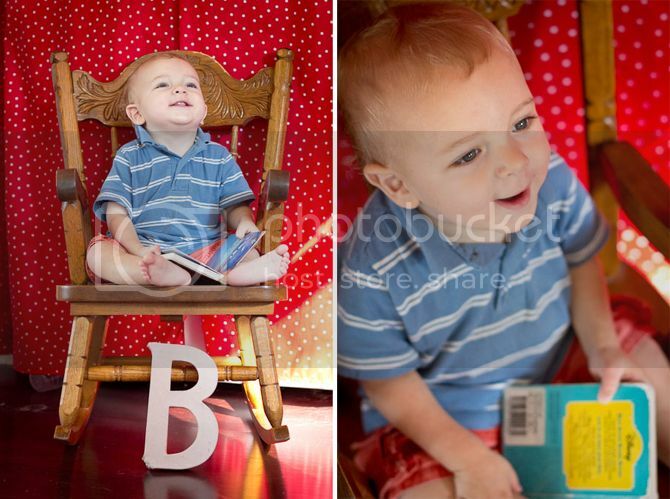 His favorite song is "Twinkle, Twinkle Little Star" and he always says "up above" in a sweet sing-y voice at the right time in the song. It's adorable. He says daddy, mama, up above, apple, tickle tickle, up please, uh oh and rhinoceros. Well ok, he doesn't say the last one. You got me. He signs more and all done, and we're working on a few more. He's picking up more and more party tricks--he can kind of show us his nose and ears, play peekaboo, blow kisses, pat his belly, do SO BIG and a couple more. He's just at that fun age where he is understanding so much of what we say and he really wants to be party of the action. Just like every month, this one's the best. And Finley, oh man is he a wild man. He's very sweet with Braden--singing him his favorite songs and repeating the little phrases I say to Braden to calm him down. We took him to physical therapy a few weeks ago to get some exercises to strengthen his foot affected by clubfoot, so we've been working on hopping, walking up stairs with kis" or "Moms" when he isn't calling me "Izzy" from Jake and the Neverland Pirates or "Minnie." Oh the imagination on that kid. He really likes to add Y to the end of words--like when he spells his name he likes to say Eff-y Eye-y Enn-y Ell-y Ee-ee Why-ee. Say that out loud. I'm impressed enough that he can spell his and Braden's names--and even more so that he has a junior version of pig latin invented. I love this stage where he's starting to pretend (telling me that our house is flying like in "UP") and have a wild imagination about things. We have lots of fun together. Can it be that we are half way to kindergarten? Is that how it works? Now I know why people homeschool, I can't imagine sending that nugget off on a big yellow bus. Brady and I will miss him too much. After being rained out a few times, we went with some friends to go pick strawberries at our favorite place--Butler's Orchard. It was a bright, sunny day and there were tons of red, ripe strawberries on the vine. Finley refused to look at the camera because it was too bright. Sweet boy. 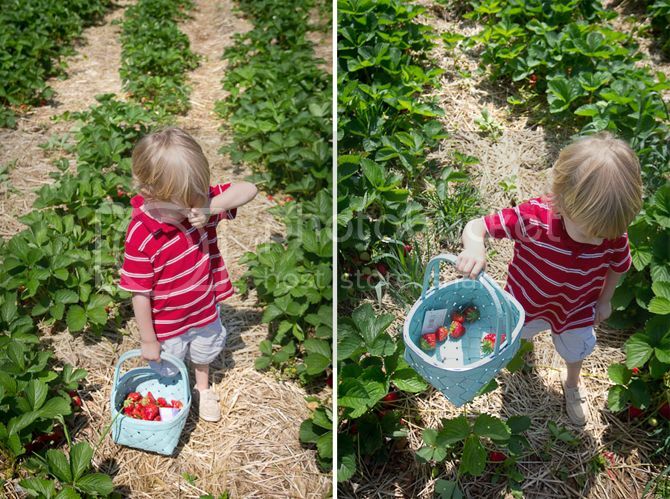 He loved walking up and down the rows and asking me if the berries were ready. Braden was not so sweet--once he realized that we were essentially walking around an all you can eat buffet he was not content unless he was eating unwashed, unpaid for berries. Oh well. Have you ever tried to bend down to pick berries with a one year old in a Babjy Bjorn? No? Well you pretty much give them whatever they want to keep them happy because of the pain that comes with squatting down repeatedly. After about 20 squats, my quads were ready to die. We had a picnic with the boys' girlfriends--Margaret and Abby. Finley and Margaret have a love/hate relationship--he loves Margaret more than anyone but he knows exactly what to do to make her upset and they continually press each other's buttons when they play! We don't know why they like each other so much because they drive each other crazy. 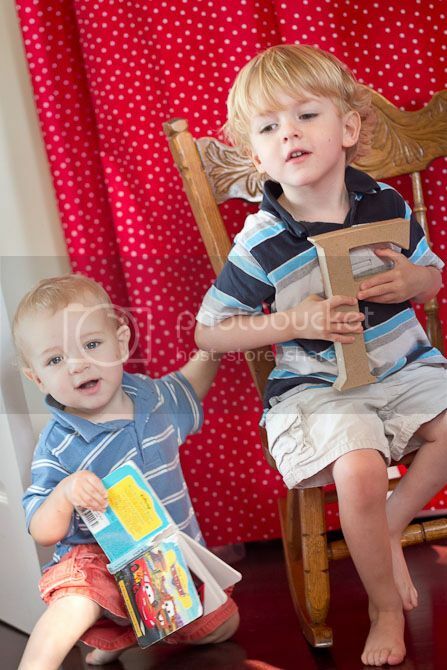 And they would not sit together for a picture--boogers. 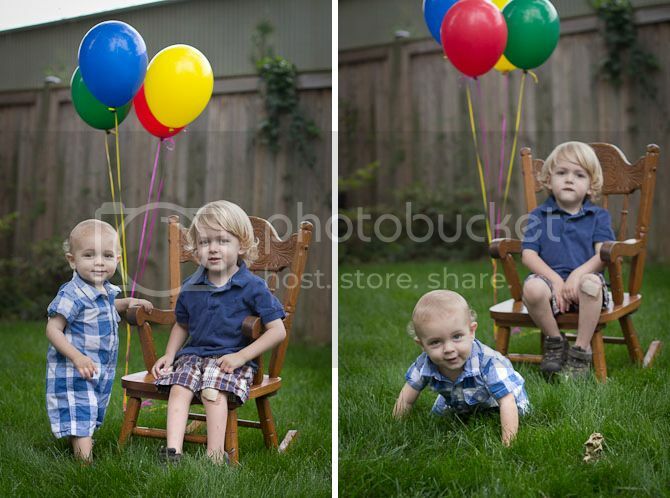 I'm sure Braden and Abby will be the same way--they'll be terrorizing each other in no time. Hi, it's me here--the Rachel who loves TV. As we take a minute to pause our collective mourning of regular season TV finales (Barney and Robin! House and Wilson! Leslie wins! 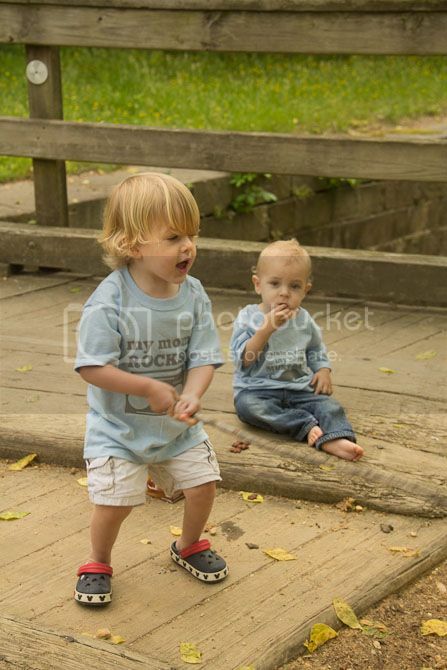 Luke and Lorelai! ), I thought I'd give you some TV recommendations to get you through the long, cold summer months. And I'd love your suggestions as well! Returning Shows to Catch Up On -- These are shows I'm worried won't get renewed and/or think that everyone would love. Obviously you should watch things like Downton Abbey and Modern Family, but I'm sure I'm not the first person to tell you that. Happy Endings - Real talk: this surprised me as one of my favorite shows this season. It's a bit like a younger Cougar Town--they have their own snappy dialogue and each character is so entertaining and just hilarious. Cougar Town - They are making the big move to TBS and I'm not sure what this means for them, but you won't be sad you spent any time with the cul de sac crew. Parks and Rec - I'm afraid to say it, but this MIGHT be my fave show. Maybe. Like Happy Endings, every character is the best. Don't Trust the B - I kind of watched this by accident and then realized that I loved it. James Van Der Beek, people. Come on. Once Upon a Time - This is my only suggestion that isn't a half hour comedy--and it is REALLY good. You only missed the first season so it's not too hard to catch up on. It's LOSTesque in its mystery--and just so good. Oldies but Awesomies -- And if none of those strike your fancy, here are my old standbys that everyone should watch. Veronica Mars, Arrested Development, and Friday Night Lights. I think those three shows couldn't be more opposite if they tried. Dark teenage detective, quirky, off-beat humor and real life football drama. What they all have in common? A cult following campaigning for a movie for each of them. Seriously, they are all such good shows. Watch them before it's too late. OH WAIT. IT IS TOO LATE. THEY WERE ALL CANCELED BECAUSE YOU DIDN'T WATCH THEM. What I'll Be Watching -- These are mostly shows that I maybe should have watched or forgot to watch or are starting in the Summer. Revenge - I've heard some good stuff... and there's only one season to make up. The Mentalist - I think I accidentally missed this season because I forgot to DVR it after we switched cable providers. Whoops? Psych - Um, same here. SYTYCD - An annual favorite. I hope that helps you get out of your TV doldrums. And really, when have I steered you wrong before? Can you think of a TV show I've recommended that you haven't liked? I'm really good at recommending TV, it's practically my part time job. So what did I miss? Any summer shows I should catch up on? Dudes. 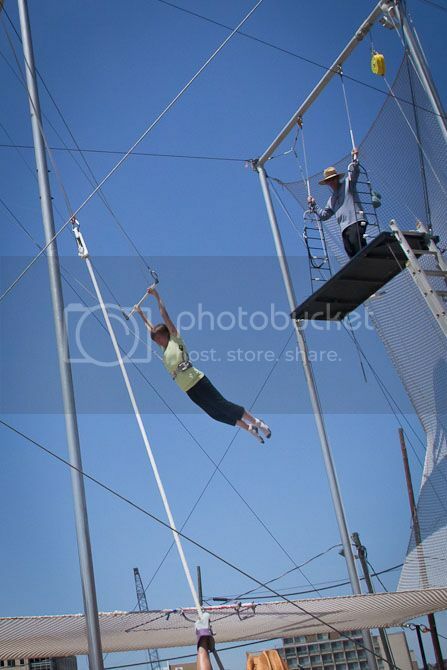 I swung on a trapeze! Here's some proof! Can you even believe it? 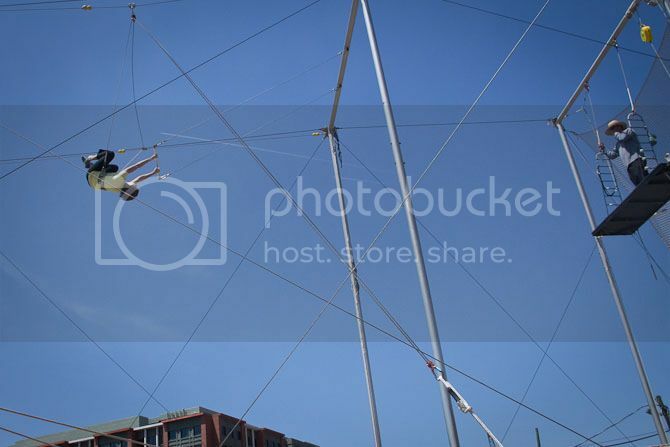 I look like I belong in the circus! 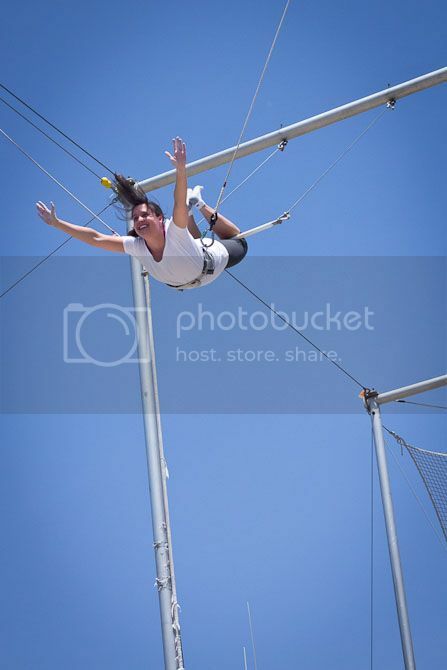 I'm flying though the air with the greatest of ease. 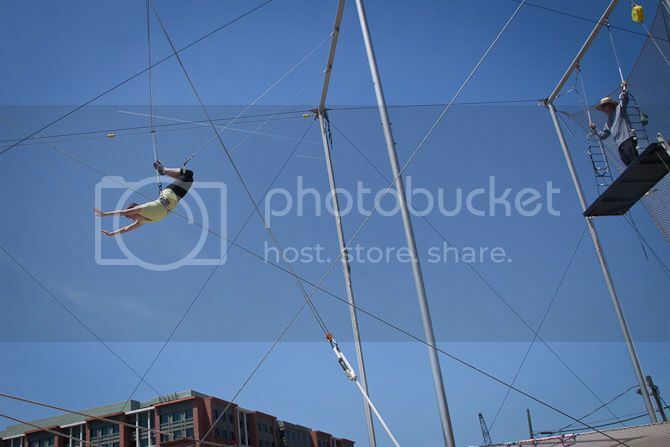 As a celebration of my friend Kristen's birthday and kind of my birthday and just because it's fun, we went and took a Trapeze lesson in DC. 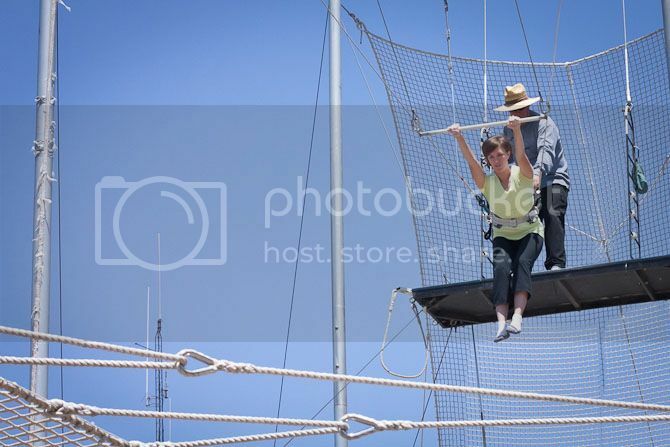 I kept thinking that I had made a huge mistake (that's for you, Kat) and was a little nervous. Turns out, the scariest part was climbing the ladder. And jumping off the platform. 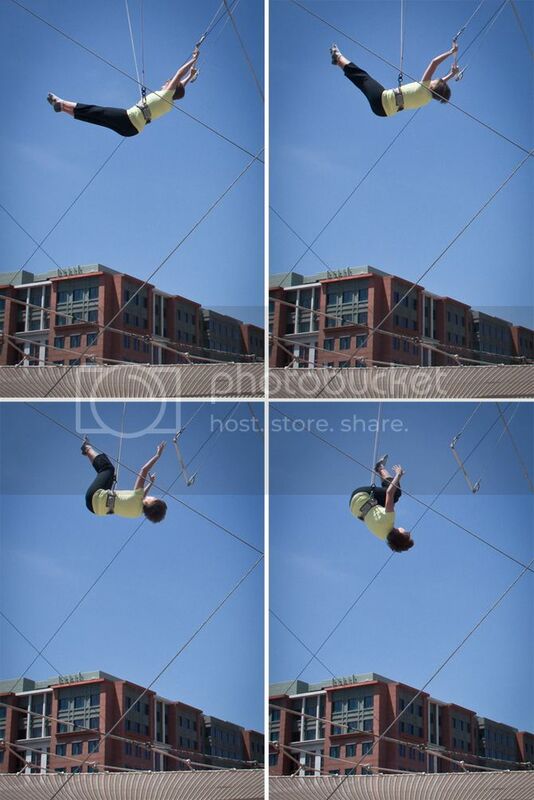 We learned two tricks--swinging from our knees and dismounting with a backflip and being caught from our knee hang. They yelled out commands for you to follow so that you would have the right timing for everything--and I got in trouble on my first swing because I did NOT follow directions. I'm terrible. One of the directions they yelled was to smile which I clearly did not do on this one. This is the look of determination. I took this picture of Kristen and she DID smile. See? It's fun! 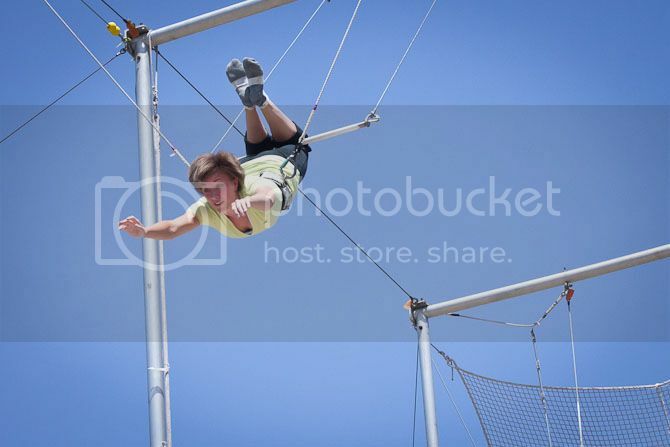 And here's my awesome back flip. There were a few girls in our class who come quite often and were doing much cooler tricks than us--and that was fun to watch. There was also an 8 year old girl--as soon as I saw her go I realized that I really wasn't allowed to be scared. They have locations in Boston, Chicago, NY, DC and LA I think... so if you live near one of them, you should go check it out. Promise you'll like it a lot. I also promise you'll be sore the next day. Apparently it takes a lot of muscle to hang from a bar. Finley's third birthday party was almost a month ago... and I've delayed in posting about it because the party blog biz is very particular about not accepting posts that have been published elsewhere (apparently, including this rinky dink blog) so I got passed over by my favorite party blog, Amy Atlas, for Braden's party and wasn't about to let that happen twice. So I had to wait to share about it here until I knew if they were going to take it. And obviously, that pretty much killed me... and then I got too lazy to post it in a timely manner. But here it is! The sailboat party! Interested in making your own backdrop? Full directions are here! We were lucky to order a rooftop carrier a few weeks before the party that came in an ENORMOUS box that I immediately knew needed to be a giant cardboard boat. Sol sweetly cut, taped and painted this bad boy. He's the best. Now the box is hanging out in the family room with the beanbag in it... obviously it's perfect for watching TV. Sol bribed them with their party favors to take this picture--I am SHOCKED that all five kiddos were willing to get in the boat and wear the hats. And look at the camera. This picture belongs in a museum--that's how rare it is. The kids really did have a lot of fun. 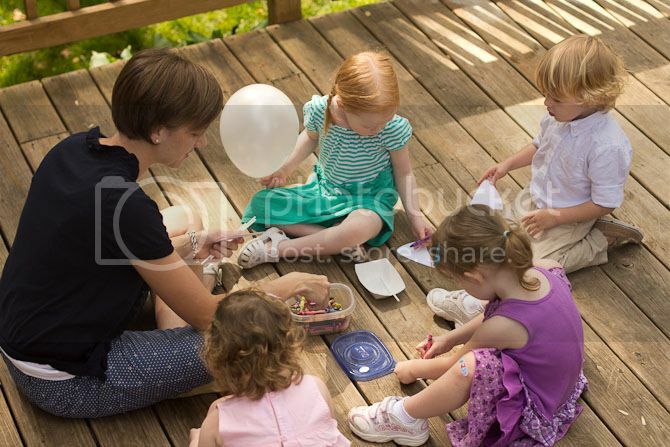 This was our first "kid" party. We had four little friends over--and that was about our limit. Braden kindly slept through the whole party, and it would have been a little tough had he been awake! 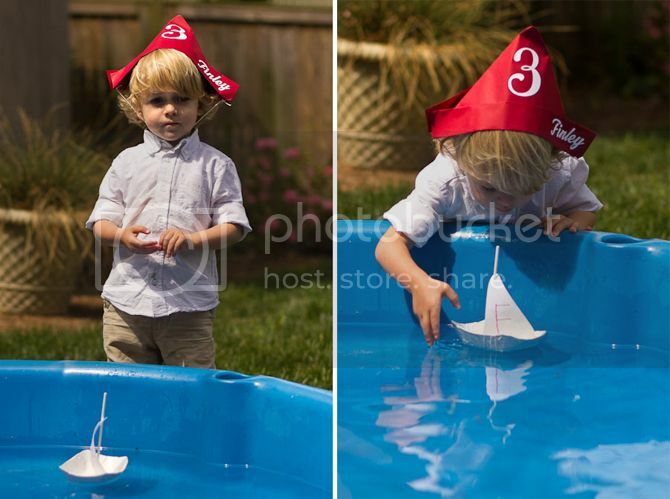 We decorated sailboats and floated/sunk them in the baby pool. It held their interest for a bit. 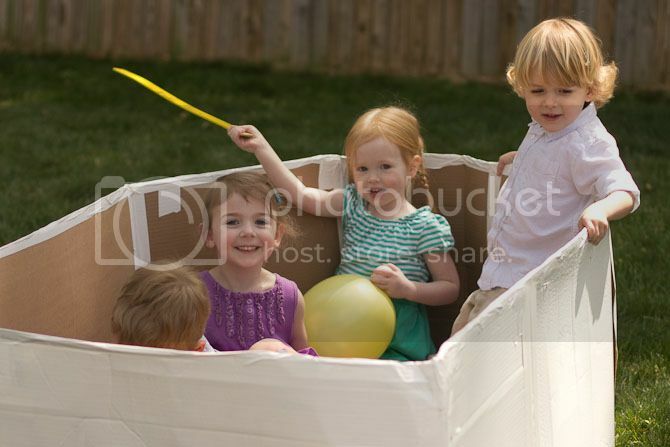 They played in the giant boat, while Sol pretended to be a giant and "attack" them. Only some of the kids thought this was funny. 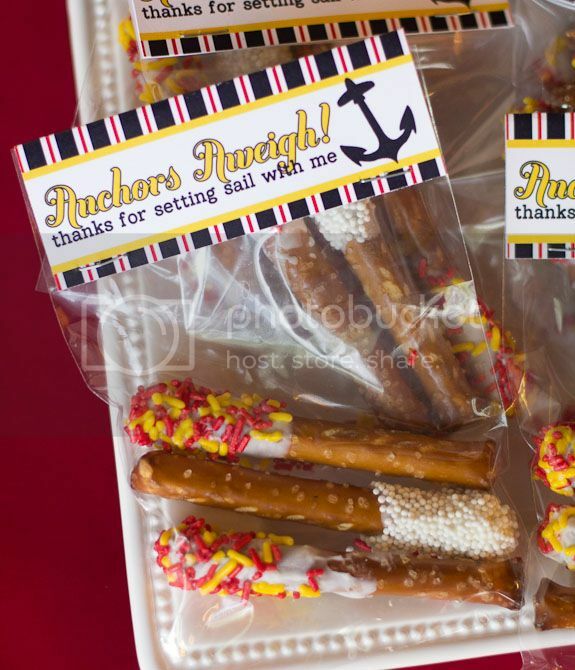 We sent them home with a little personalized shovel and pail, a bag of chocolate pretzels, as well as their personalized hats and boats. 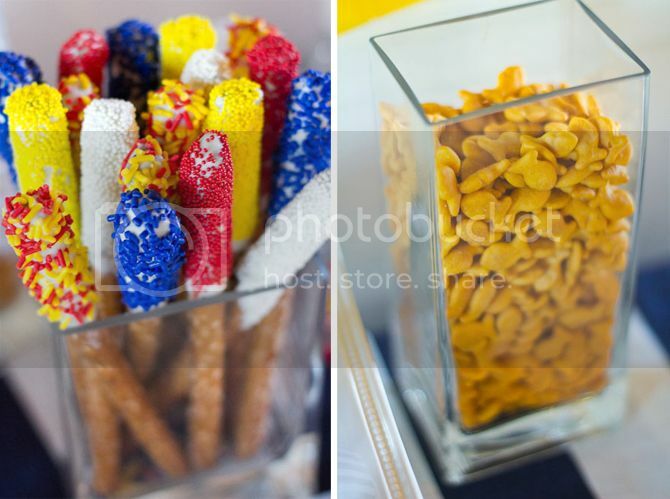 I can't even begin to explain how loved those pretzels were--seriously, I couldn't get them to eat anything else. Not even their cupcakes! I tried to focus the menu on kid friendly maritime foods. 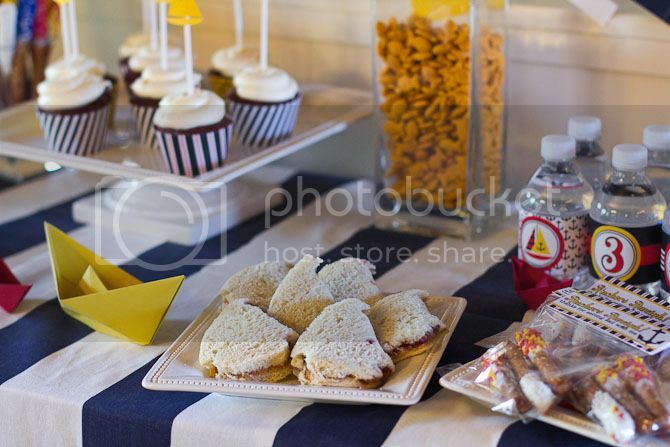 Goldfish, pretzel oars, jello cups with apple slice boats, sailboat sandwiches and ice cream sundae boats filled with fruit. Also cupcakes, but as I mentioned, no one wanted them. So I ate eight. And one of my favorite parts of the party--the banner! 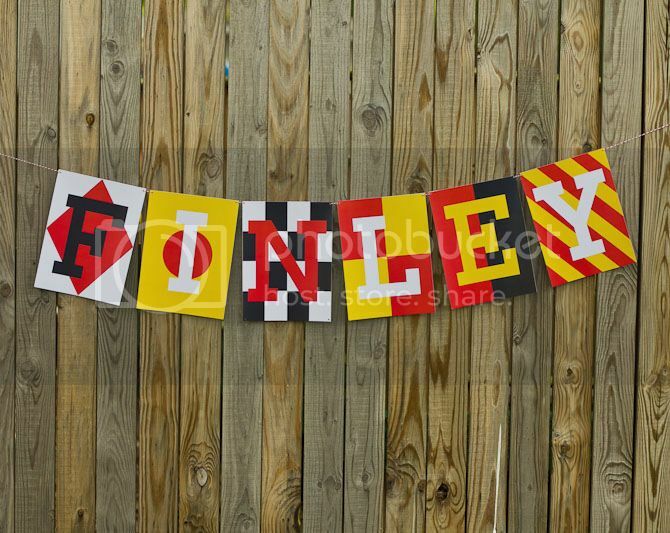 I painstakingly made a version of every nautical signal flag in every letter... then used these six to spell Finley. Isn't he a sweet birthday boy? 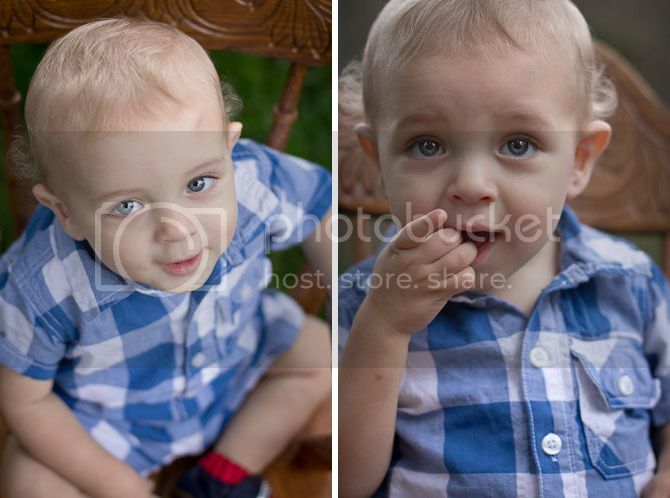 I just can't believe he's three. All paper decorations are available in my Etsy shop! It's been a good week around here. And just when I think it can't get much better, it does. Marathon PR. 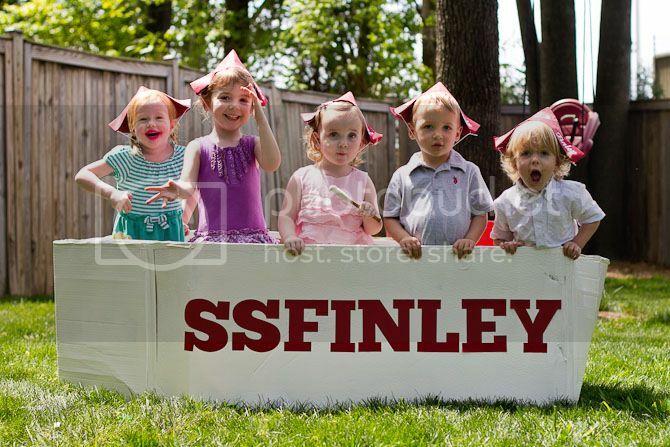 Finley's party featured on Amy Atlas. Braden's party was inexplicably and randomly pinned by Sherry from YHL (what?!?). 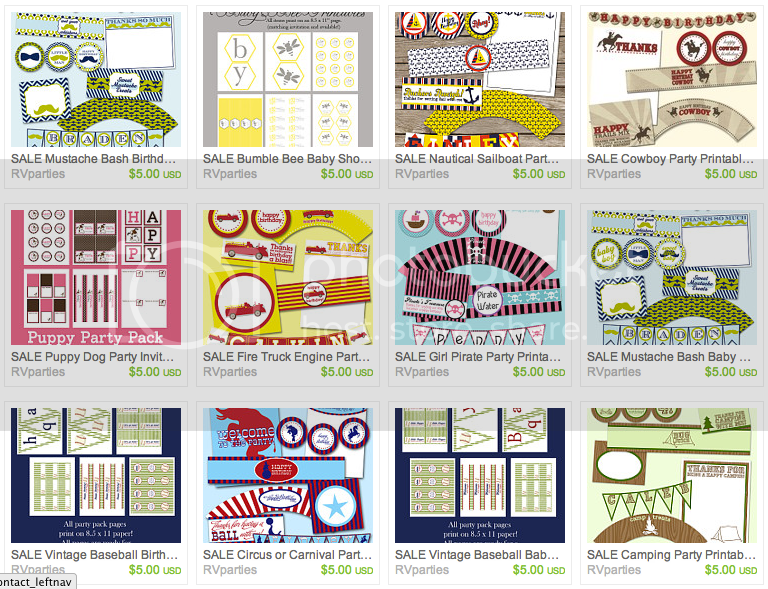 A great week of sales from our Etsy promo. And then--I got a part time job I thought I was underqualified for. Next year, for 10 hours a week I'll be assigned a school and will be mentoring first year teachers there--the absolute perfect job for me for next year! Top that off with a lovely Mother's Day with my family and my birthday on Thursday--I'm feeling pretty blessed. Beyond blessed--I feel undeserving of all the good in my life. Real talk: While I was getting my Mother's Day pedicure, I was cruising through the internet on the old iPad. 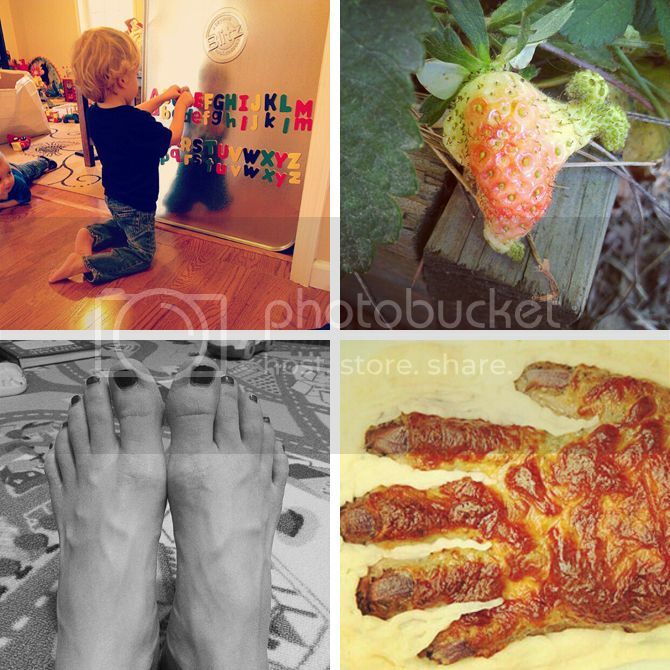 I kind of fell into a sad corner of the internet--inspiring blogs of strong mothers who have lost their children, patient women waiting for their children, women who have lost their mothers and gracious mothers of children with special needs. And my heart was broken and I just had the strange feeling in my soul of how undeserving I am of these two lovely, healthy boys. How unfair it is that some babies are born sick--or how some babies don't have mothers at all. I was reminded of how very little room I have to complain about anything at all. I know that I'm blessed--but I don't think the other mothers feel any less blessed. Just as I know I wouldn't feel any less blessed if the boys were any different than they are. I just love them because they are mine. So those are my not-really-uplifting thoughts on Mother's Day this year. I'm so very happy and feel so very blessed with our lot in life--but can't help but feel very underserving what we have. I suppose that's exactly what God's grace is--having what we most certainly do not deserve. So hug the moms that you know next time you see them and the women who will be moms some day. Or hug anyone who has a mom. So I guess just hug everybody all the time. That's good advice, right? Maybe no hugging strangers unless they look friendly. And while I'm telling you what to do, be grateful for what you have! Praise the Lord, people. I love these boys. 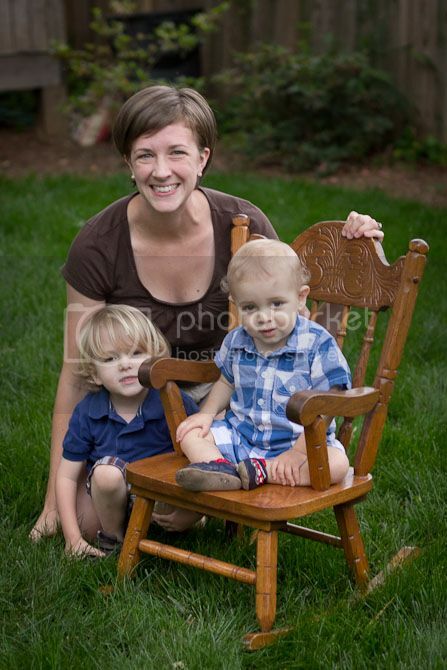 I'm so glad they've made me a mother. 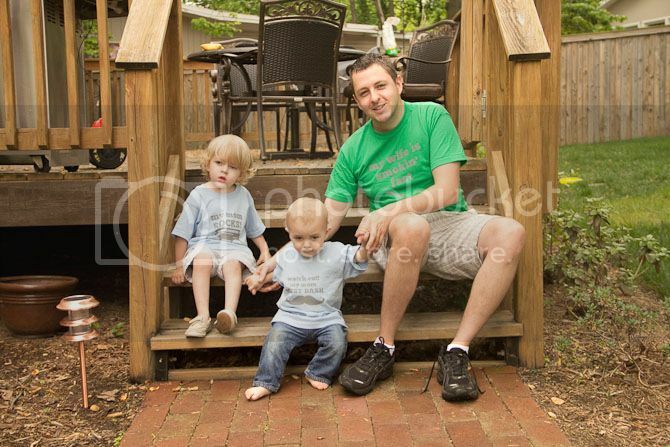 And look, almost all three of us smiling. The best present I could have asked for. It's been such a great week. I told Vic last night my luck was about to run out--I mean I ran a great marathon, the sailboat party was featured on Amy Atlas AND THEN Sherry from Young House Love randomly pinned the mustache party. She has a half a million followers. Terrfiying. I mean, I feel like I've just been hitting the life jackpot lately. And then last night, my luck ran out. Braden slept less and screamed more last night than he has in his whole life. 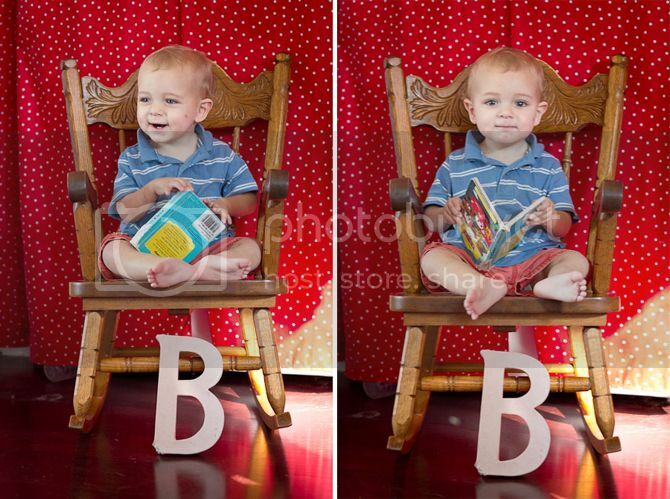 I have no idea why he was so mad--teething, maybe? Needless to say, we watched Glee on the iPad until 2 AM when he finally fell asleep for a bit, then finished the night off with rounds of screaming and not sleeping. He's playing really happily in his high chair now. And I'm typing very grumpily beside him. I'm a much nicer mom with more sleep. 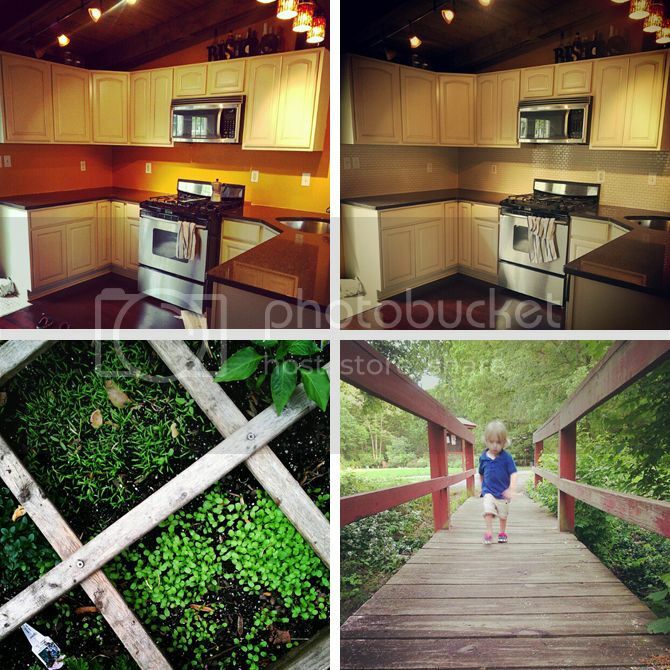 And now, the last two weeks in Instagram. 1. A Pinterest activity--large oil pan with magnet letters. 3. My feet. For some reason I decided to start Instagramming pictures that I knew Vic would hate... I don't even know why. 2. New kitchen with BACKSPLASH! 3. This is what happens when you dump expired seeds in your garden to see if they work. 4. Speedy boy on bridge. Exciting Etsy News and a BIG Sale! 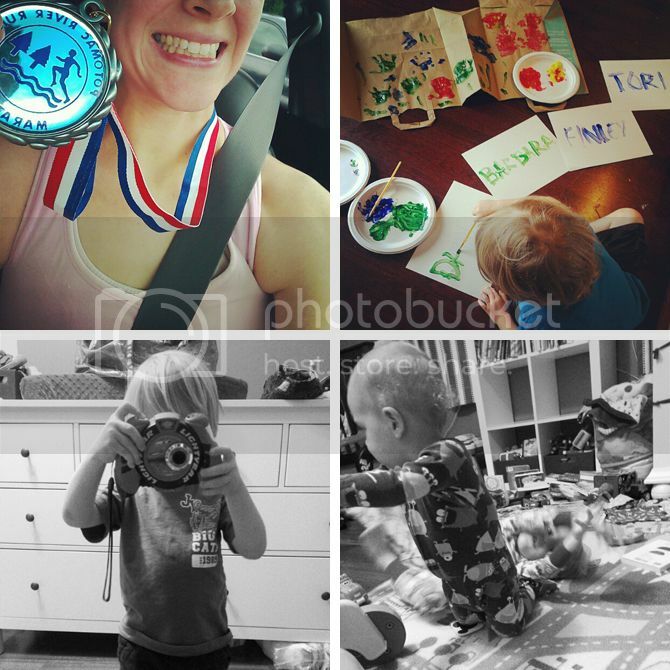 Lots and lots of exciting things happening around here... thanks so much for all the love on Facebook and on the old blog about the marathon. I'd be lying if I said I didn't think of the internet while I was running. It's so nice to be loved and supported by so many! 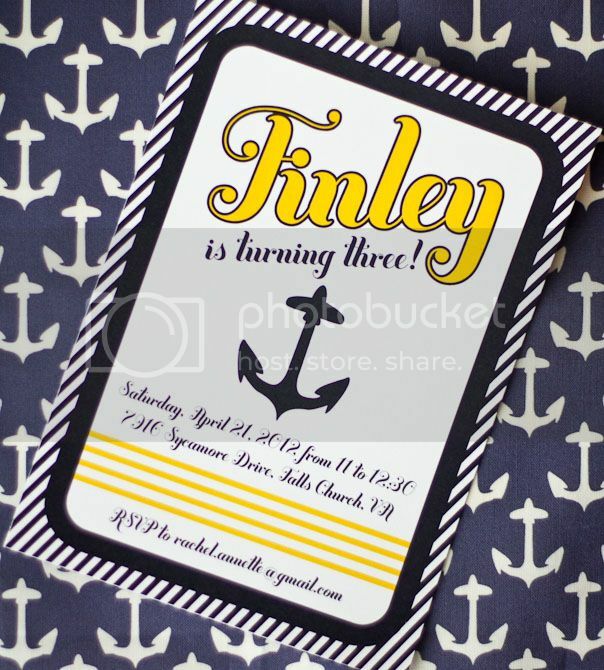 In party planning news... Finley's birthday party (which I haven't posted about here yet, because they don't take parties that are already published including this site!) 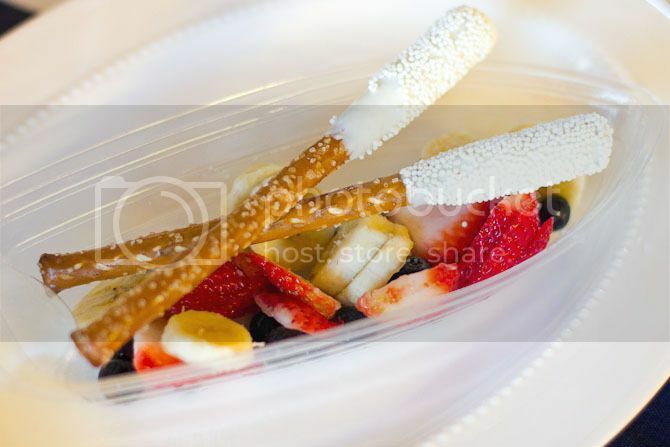 was featured on my FAVORITE FAVORITE party planning site, Amy Atlas Events, last Friday. I was and still am SO excited and honored. If you want a sneak peak before I post everything here, go check it out! I'm so proud and pleased. To celebrate the awesome marathon, Amy Atlas, Cinco de Mayo, the Kentucky Derby and everything we could think of... we're having a sale over at RV Parties! 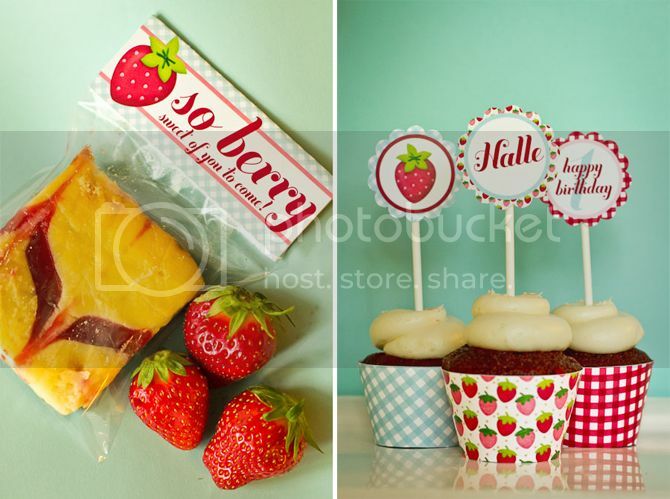 All of our pre-made party packs are only $5--normally they sell for $20. We have 17 awesome designs--great for parties and showers. You can buy one now and use it whenever you want! 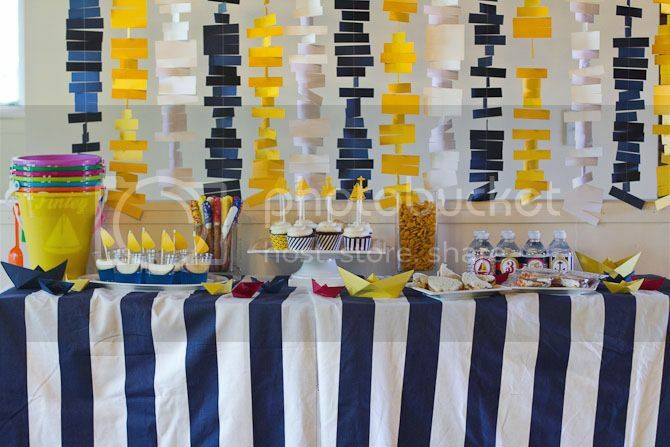 It's a great way to tie together any party, quickly and cheaply. If you don't have any parties on the horizon, you can show us a little love by liking us on Facebook and sharing this with your friends. At the very least, we'd love to be introduced to your Facebook world in case YOUR friends have parties coming up! If you do share with your friends, let us know and we'll give you a code for $5 a matching invite as a little thanks. Well, I said either I would kill the marathon, or it would kill me--and in the end I think both happened. I think it was like a old West shoot-out where they march 10 paces and draw--and we both shot each other in the hearts. Or quads, in my case. Anyways, it was a GREAT race. I wanted to run under 3:40 and dreamed of running under 3:35, but knew I had no business doing that. I ended up at 3:39:02 (unofficially--it wasn't chip timed, they pulled the tag off my bib which was INSANE) and was just thrilled. I apparently can't read a website and thought until after the race that this year's Boston qualifying time was still 3:40, but upon closer inspection it's actually 3:35. I think I was confused because I seriously didn't know what year it was. Whoops? I'm still claiming that I Boston Qualified--unfortunately it was for the race last month. 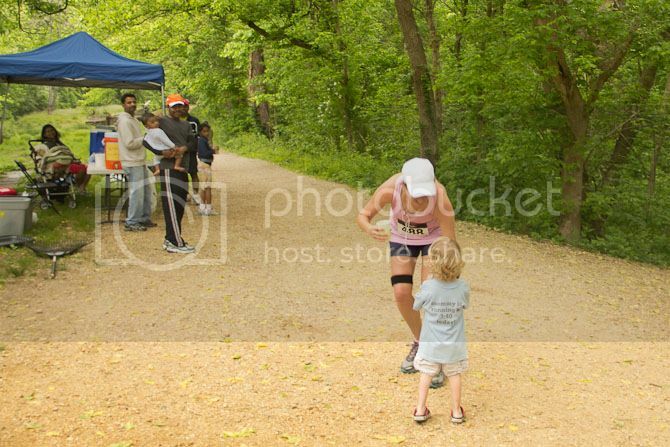 :) My goal since 2006 has been to run under 3:40 AND I DID IT. No matter what the BAA says, I qualified. 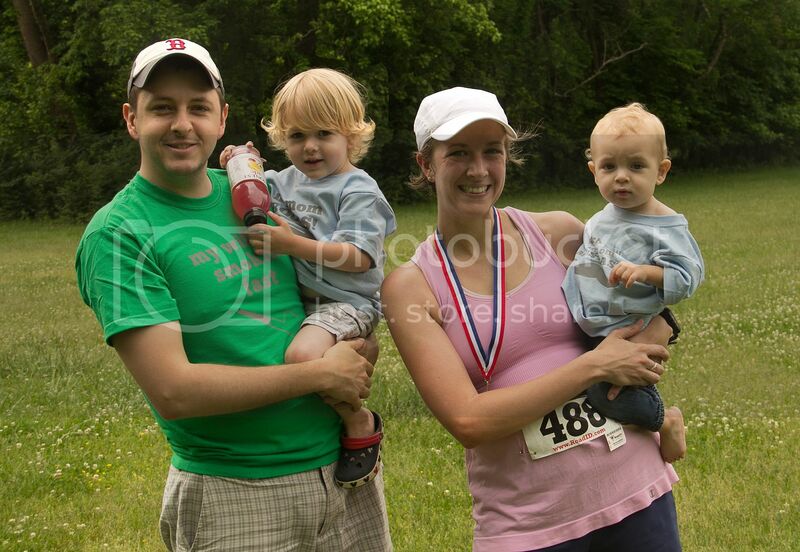 And truth be told, running Boston in 2013 was going to mess up my ability to grow Finley and Braden a sister... I would rather run in 2014. So watch out Chicago, you are next on my list of marathons to kill and be killed by. And here's the race recap. Saturday, we went to Mellow Mushroom in Adams Morgan for some carb-loading, which is one of the parts of marathon training in which I excel greatly. I ate that pizza so good, dudes. So did B-Town. Look how happy he is. The race had two start times, and I opted to start at 6:30 rather than 7:30 so it would be a little cooler when I ran. 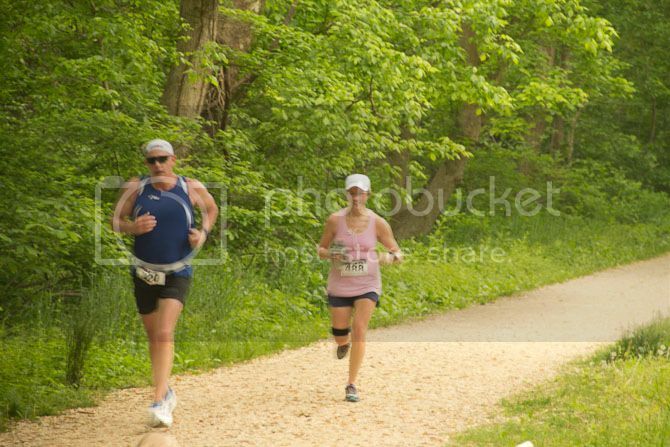 Less people ran this one (I think I was the 3rd girl and 15th person in that race!) so it could have been really difficult to run if no one was near me. 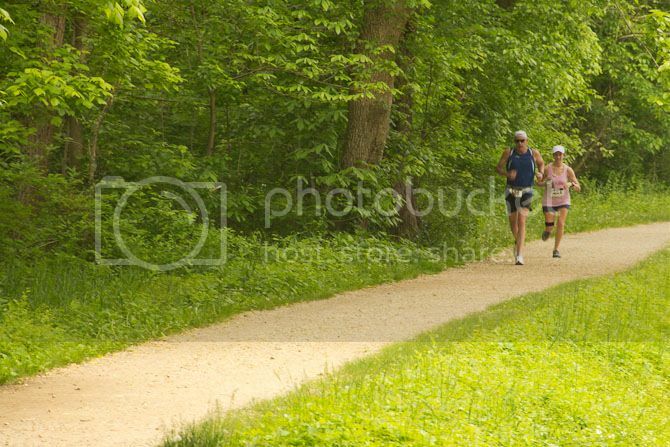 Luckily I stayed a few strides behind a guy in a blue jersey for about 19 miles and averaged 8:10s for that part. Seriously. I kept wanting to slow down but I didn't want to lose my pal, and I felt really good. (Which is what always happens... the first 20 miles are easy and then you die.) The last six miles is where I got kicked in the pants. Repeatedly. I passed the blue jersey dude and a couple other dudes (!!!) even though I slowed down A LOT. It was sliiightly up hill the whole way back with a few very short, steep inclines over some locks. I wanted to keep it under 8:20... then 8:30... and finally hoped and prayed I could keep it under 9:00 for the last 6 miles. I ended up averaging 8:39 for the last 6.2 miles, which is something of a miracle. Sol and the boys saw me at least 5 times... along with the 20 other people cheering. Seriously, having a crowd and other runners make a HUGE difference. If it wasn't for blue jersey man, it would have been a very different race. I ran with an iPod for the first time ever and spent a good amount of time picking the perfect play list with songs at the right times to inspire me (I'm a little obsessed with Florence + the Machine lately... let's just say "Dog Days are Over" and "Shake it Out" made up a good chunk of the playlist.) However, dumb iTunes took it upon itself to fill my iPod with other junk since I didn't use all the space... so I had to skip over a lot of David Archuleta. Sorry, Archie. It's not you, it's me. Sol designed (and I helped with font choice and using the Silhouette...) really cute shirts for the boys and him to wear. I loved them. They say, "my mom rocks" with a boom box, "watch out! my mom must dash" with a mustache and "my wife is smokin' fast" with a pipe. And the backs said "lucky number seven" for Sol, "Boston or bust" for Braden and "my mom is running a 3:40 today!" for Finley. They were great! 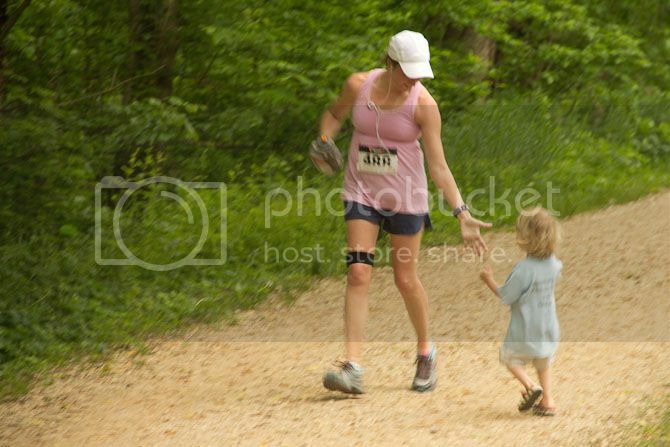 And one of the best parts of the whole race is that Finley would run out to me on the course and say, "Here's your water bottle, mama!" as he handed me my bottle. Too sweet. I always have to thank Sol--for giving me the time to train and for carting two squirrel-y boys all over a marathon course to cheer for me. I love that he makes this possible for me. All in all, I'm thrilled. I didn't crash quite as hard as I sometimes do in the finish--I'm actually pretty proud of those last 6. My quads are HURT--I tried to take an ice bath but accidentally used warm water instead of cold water and it melted my ice. But I did foam roll! Yippee! My knee brace also removed some of my favorite skin on my leg--normally I take it off after 10 miles when it starts to chafe but apparently it cut right through the nerve endings because I wore it the whole time. It's gross. I didn't hurt my IT band like I normally do when I run hard--no injuries at all this time! I'm just happy. I'm not going to be able to walk down stairs for a week, but I'm happy. Going forward, I'm registered for Chicago in October and am excited to run. It's pretty much the polar opposite of this race in a great way. I signed up to run with a training group starting in June which is something I've never done before. I pretty much train alone so who knows what will happen when I have other people to run with and coaches to advise me. Olympic trials, probably. I'm running a few 5Ks in the next few months (which I can't recall ever running one before, so I'm excited about races that take less than 30 minutes to finish) and am excited to see what I can do. I clearly need to work on finding some speed at the end. And I probably need to make a date at my nearest track to do that. Ugh. Holy long post! Did you read all that? If so, I'll send you my tacky terrible medal to wear for a day. Also the t-shirt I got was ironed on--not even screen printed. It was a little rinky dink marathon, but it was great. I PRed and FINALLY achieved my goal. Sub 3:40, baby. The best thing about the monkey that is AS SOON AS Braden hears it, he immediately flops on his belly and spins in circles.